We’re heading into ‘crunch time’ for summer purchases of Interactive LEDs in the school market. We thought that in this week’s blog post we’d take a look at the top 9 tips for choosing an Interactive LED. When you first look at deploying interactive LEDs in your school or district you first need to look at how many rooms you are going to do, then look at your overall budget. This may seem like somewhat of a mundane point but you need to know how much money you have per classroom. When you have that figure you can work back from that and also set your expectations accordingly. There is no point in looking at 86” LEDs when you only have a 3000 USD per classroom budget! In our experience, with a budget of 5000 USD per classroom you can get the a 75” delivered, with wall mount and installation. Do the installations yourselves and save money there too. To draw on our own offers, we’d expect s 75” to be delivered for 3999 USD from TouchIT Technologies. Size is often dictated by budget rather than desire, but let’s look at what we see in the market. 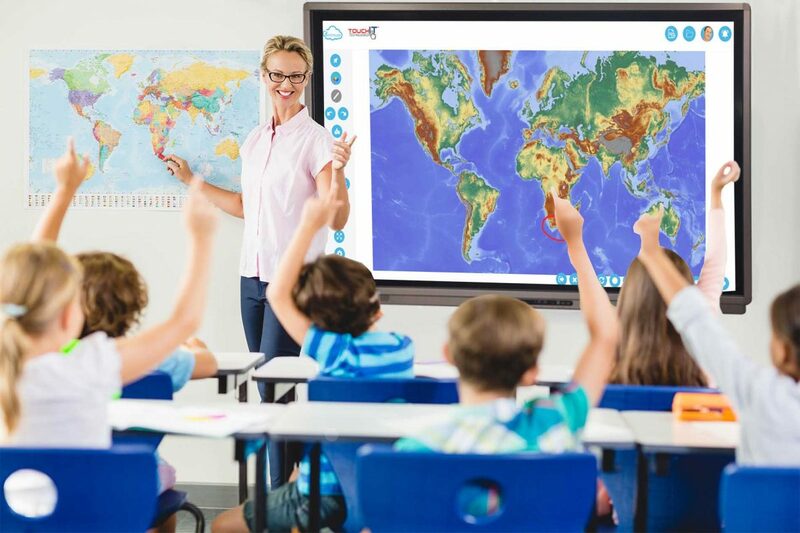 We see that the most popular size in the classroom is 75” – this is because it is comparative to the interactive whiteboards as they were but also it is a good size for a 40 person room. A 65” is a little small here and an 86” tends to be too expensive. Wall mounted? Rolling trolley cart? Height adjustable? Electric height adjustable? All of these are considerations that you need to have a look at. They do vary in price from a couple of hundred bucks for a wall mount to two thousand bucks for an electric height adjustable trolley. There are definite advantages of height adjustable systems so if you can get this into your budget, we would really recommend it. A point to note here is that mobile trolleys with say a 75” LED on are still not that mobile. They are bug, bulky and heavy to move from classroom to classroom. In reality, they are a good option when a wall mount is not possible, but they are not in our opinion something you are really going to move from class to class. We’ve seen the market do a complete 360 in software. At first, it was the software that made the sale of the hardware. Then, it was all about the hardware, and now, it is back to being about software. Is there an annual fee? You don’t want this. Is there a fee for more teacher or more student users? You don’t want this. Is it a proprietary format? You don’t want this as it could cause you problems in the future if you want to move onto a different platform. Is there their possibility to connect with other devices you have already? You do want this. Even if you think that the features on offer are not going to be used, you need to consider that in the future they will be. We touched a bit above on the collaboration with other devices you may have such as Chromebooks. You want a piece of software that is going to do that for you even if you are not in a position to make use of it straight away, you will at some point. Look for something that is not going to charge you extra for this – it should come as a standard. So you have just invested heavily in all of this kit and technology. Shiny new screens are hanging on the wall, now what? How do you use them? You need to make sure that the company that you are using for supply can also assist you into and professional development. What materials do they have available online? Do they offer webinars? Do they do on site in person trainings too? Do any of these come at a cost? These are all things that you should be considering. At some point, you are going to need some support. You should be able to easily get in touch with your supplier to get the answers and support that you need. Have a Google around the company and see what people are saying online about their support. Test them out, put in a ticket or try them on their online chat – see how you get on and whether you feel comfortable they would be able to assist you with a problem down the road. This is a great industry to be involved in. We’ve been around for 10 years now and seen a lot of companies come and go. Make sure you are looking at an established and reputable supplier and not a new start up that is not likely going to survive last your warranty period. Also, just because you know the brand name, doesn’t always mean they are a good supplier. Just a tip here, the household names are not specialists in touch screens and I can name two that have pulled out in the last 12 months alone. There is no harm in asking your prospective supplier for references. Ask them about support, the product and of course any training they have had. Ask about their experiences and did they get help when they needed it. At some point, you are going to need something from your supplier so make sure you know you will get it! At TouchIT Technologies, we’re more than happy to help with any supply needs you have. Drop us a line or give us a call and we’ll be more than happy to discuss your requirements and answer any questions that you have. As you might have guessed, this article is geared around us and what we do to help our customers – give us a try! We excel on all of the points above!